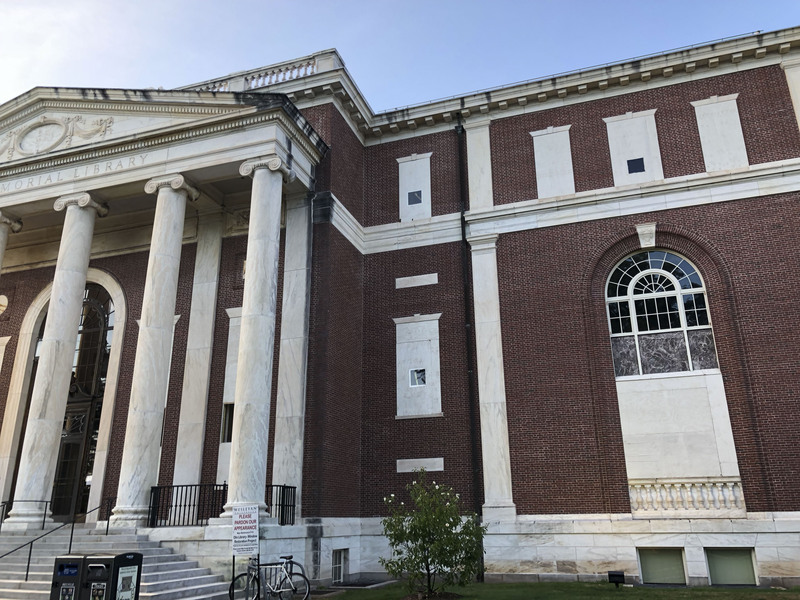 Several of the windows of Olin Memorial Library have been removed and are being restored, a project that has led to temporary closures within the library. According to a post on the library blog, all of the library’s original windows were removed from the building early this summer and sent off campus to be repaired. This restoration will ensure that the windows, which are original to the 1928 building, remain in good condition. In the meantime, the windows have been replaced with plywood inserts. The restoration does impact students using the library, as some spaces in the building will be closed for part of the semester. Caleb T. Winchester University Librarian Andrew White detailed these closures in an email to the student body. Smith Reading Room will be closed through the month of September, but students can still request books from the room’s online collections and pick them up from Circulation. Special Collections and Archives will be closed until September 10, though students with urgent needs may schedule an appointment earlier than that via email. The service window and reading room in the Music Library will remain open, but the listening rooms are closed until September 19, and students will still have access to the scores and recordings within those rooms via the library staff. White’s email also mentioned the creation of a new study space that will help offset the loss of the Reading Room. “Thanks to the creativity of the library staff, we now also have a new group study space in the Microforms Center on the ground floor of Olin,” White wrote in an email to The Argus. According to a construction schedule published on the University Facilities website, the restoration process started at the end of May and coincided with another maintenance project to replace the carpeting in several common areas of the library’s first floor. All work in the library is scheduled to be completely finished by the end of October.